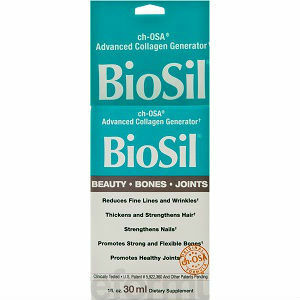 BioSil contains rejuvenating collagen generators according to the product source. Collagen gives structural support to the entire human body, including hair, skin, nails, joints and bones. BioSil’s patented collagen generators according to the product source work to thicken and strengthen hair, reduce fine lines and wrinkles, increase skin elasticity, strengthen nails, increase bone mineral density at the hip region, and increase the formation of collagen. BioSil is not made out of collagen but generates collagen by switching on the body’s own collagen producing cells. The product source website contains no information about product ingredients. The product comes in a 1 once container. The product source contains two sets of dosage instructions depending on expected use. For skin, hair, nails and joints: take 5 drops, 2 times per day. Mix in with a 1/4 cup of liquid (preferably juice) and drink immediately. For bones: take 6 drops, 1 time per day. Mix in with a 1/4 cup of liquid (preferably juice) and drink immediately. The product source contains no information about product price, return policies, warranties or customer reviews and testimonials. The product is sold through a network of dealers. The product source contains a link to a website page that provides a tool to locate dealers in a particular geographic area. The product source provides no information about product guarantees, warranties or return policies. The product source leaves a lot of unanswered questions about this product including information about this product. Anyone considering purchasing this product would be well advised to visit a local dealer to fill in some of the information gaps discussed above prior to making a product purchase. Mark Stevens	reviewed BioSil	on January 17th	 and gave it a rating of 2.